Last Autumn when out on a walk with Tickle, curiosity got the better of me. We stepped off the road well travelled to venture across a patch of former agricultural land that so far had been 'out of bounds' to us since it was screened off by thick brambles. The land had been cleared with a clear purpose: to make way for a residential build. That's the way things tend to go these days in Corsica. Land formally dedicated to agriculture (mainly until just after WWII), then suffered decades of utter neglect before being reclaimed and repurposed into real estate. Land clearance, in this instance, had opened a rare window of opportunity for our mini-adventure. So there we ventured (trespassed even! ), Tickle and I, across that patch of land for a little wander, heading towards a brook. And that's how we came across that little treasure that so typifies rural Corsica: a stocky, rustic-looking stone construction. It was erected in the immediate vicinity to the brook, sadly yet predictably in a state of semi-dereliction (no roof and the floor completely caved in, no doors nor windows), but strangely not looking sorry for itself, if you would pass me the expression. It seemed that the building was in perfect communion and harmony with its surroundings, like it had always been there - and was meant to be there. Upon closer inspection I discovered this used to be a water-powered mill, either a flour or olive oil mill, not only through the strategic location of the build, but also by its architectural clues, most notably its grinding/ pressing stone wheel, now split in half and lying amongst debris. I fell in love with the mill straight-away and have since taken the liberty to visit it several times. If I had money to burn, I would trace back the owners (allegedly a formerly wealthy local family), make them an offer, and get a heritage architect on the case to get it restored to its former glory. What fascinates me most is that depending upon the time of day and luminosity levels, the building becomes alive (thankfully not in a Stephen King sense! ), with ever-changing shades and reflections reverberating off the stonework. This is encouraged by the rugosity of the stones and their individual colourings, some of them smooth eau-de-nil rounded pebbles that I imagine were picked off the brook. The mill is surrounded by a cluster of olive trees and oaks and you get a very astmospheric mood. At the height of winter you get an early-morning fog stretching across. Meanwhile everytime I look at that mill, I cannot help but think of J.M.W. 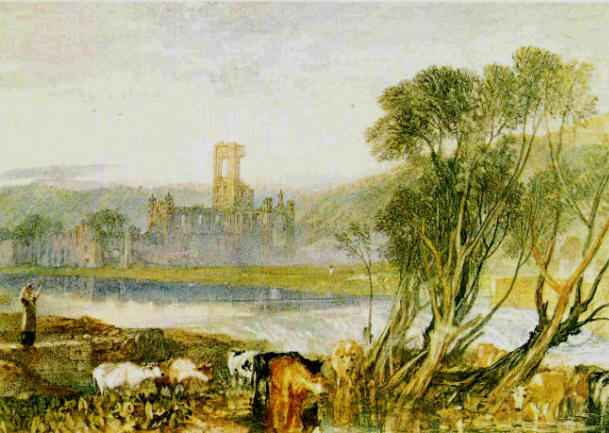 Turner (English romantic landscape painter and watercolourist, 1775-1851) and his fellow contemporaries who depicted timeless, nostalgic English rural scenes as an antidote to the ravages that the Industrial Revolution was inflicting to the kingdom's towns and cities. Tumbling barns and chapels, semi-derelict country houses, all set amongst a bucolic genteel countryside of trees and hills and streams, the sort of landscape where you can reconnect with yourself and lose your thoughts in, smell the woodland moss, feel a pinch in the air and stroke past a scattering of dew-saturated jonquils down the bankside. I am convinced that Turner would have loved this little Corsican mill! Almost a thousand miles away from Albion, this mill feels like my own private Turner connection, my Turner painting, Turner scenery, Turner Prize... I wish I was talented enough to even attempt at painting it, but that would be stretching my artistic capabilities. Instead Photoscape has operated its magic for me (see below), by doing all the legwork - I mean the brush strokes. The result is no Turner chef d'oeuvre, but in my mind this is the missing piece in the Turner puzzle: the scene that had Turner written all over it, the scene that he should have painted... but destiny decided otherwise. What a beautiful little building. You're right, it looks as if it belongs right where it is.